In 2006, Steve's company closed and he had the choice to look for work or to pursue his art career. He chose art and we have never looked back. I joke that we live in an art gallery, but I love the fact that we always have beautiful art on our walls. I don't like it when a favorite painting sells or is out at a show. But, I learned long ago that if Steve's income was from art then I had to accept that I will sometimes lose a favorite painting. In some cases, he has actually repainted one for me. This yellow truck sold quickly after being in an art show. He repainted it for me twice the size and it hangs on our living room wall. I dread the day it sells. Discoveries Wine uses Steve's paintings for wine labels. 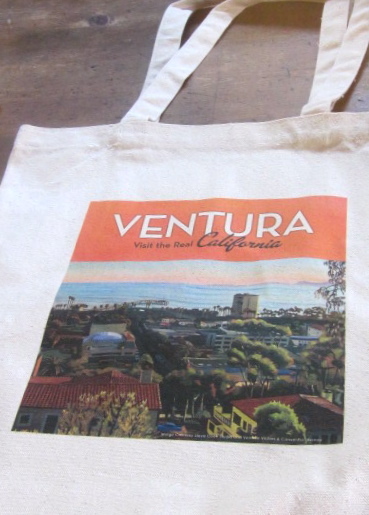 The Ventura Visitor's Bureau uses Steve's work for promotion on canvas bags, posters and brochures. He has fun, doing what he wants all day, and the best part is that people actually pay him for it. It is very easy to see why this painting sold fast. Does your Steve have a blog, where he sells his work? This piece is perfect, there is no other word for it. Steve's art is beautiful! And it is so nice to find someone doing what he absolutely loves - and making a living at it! I would probably want to keep all of the paintings, too! I can see why you hate to part with any. That's the nature of it, though. Love your cottage - where in Calif are you located? I lived in Northern Cal for 8 years. Sometimes I don't know why I left, but here I am in snowy RI!!! I love art so much. What great talent Steve has. I hope his shoulder heals quickly so he can continue with what he enjoys. The truck painting is fabulous. Gorgeous! You are so lucky to have someone so gifted in your life. I went to Art school and they always told us to have a back-up plan- so nice to see an artist doing what they love for a career! Your husbands art work is amazing. I've seen Steve's work since my mom lives up in Ojai. Just found your blog through the blog Nana Diana. Your husband is a great talent. I look forward to your posts. Carol, Steve is a fabulous artist! I love the painting of the old truck! It must be amazing to be able to paint like Steve does. I love the truck painting too! How wonderful that he is able to follow his passion, love his work!!! Did I mention I think Steve's work is spectacular!!! Good Luck with your son's wedding and everything, don't work too hard and pace yourself. It will all get done. Wonderful artwork! He's a talented guy.